The first project, described in the first post, turned out pretty well, but had a few areas for improvement. First, using the two needle technique resulted in an gap made up of more open stitches due to reduced tension at the point the knitting moves from one needle to the other. Largely the result of my somewhat sloppy technique and poor attention to tension, it can be cured by more precise knitting, or by simply knitting one or two stitches from the second needle onto the first when making the switch to the second needle. I chose the latter method. 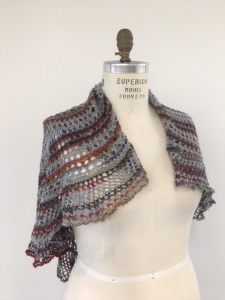 This is a shawl made using the basic pattern and finished as described in the instructions. 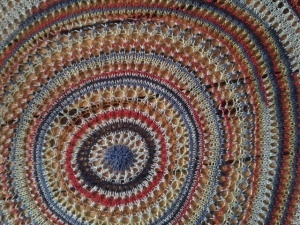 This is the piece in on the blocking mats. 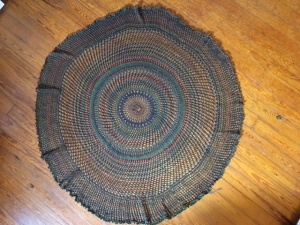 It was blocked using stainless steel blocking wires pinned to rubber blocking mats and pinned out to just about 48 ” diameter. 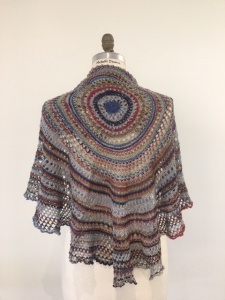 You can see the spiral pattern created by the repeated pattern – the yarn over/knit 2 together with a single knit row between created a definite right-handed spiral pattern, which is attractive and also makes the piece quite elastic with a lovely drape. Also, you can see the results of the doubling of the number of stitches as the spiral “ribs” double in number with increase. And the increasing number of rows between each increase is also apparent. The yarn used for this scarf is from “Viking of Norway” and is the Nordlys superwash wool. 75% wool, 25% nylon, it is a single ply, soft spun yarn that knits up beautifully. The color was #965. The yarn comes in 100 gram balls, and I used one ball and about a quarter of a second ball, so it took about 125 grams (about 475 yards/435 m) for a 48″ diameter scarf. 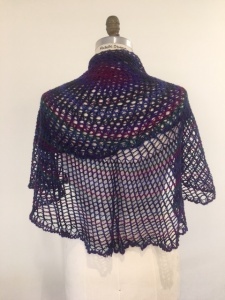 You may wish to vary or break up the prominent spiral pattern of the basic shawl pattern. This can be done several ways. One easy way is to vary the pattern by doing some knit stitches between the yarn-over-knit-2-together basic pattern. Such as yarn-over; knit two together; knit 2 (or 3 or 4) then repeat. Another way is to use the basic yarn-over-knit-2-together row but knit two or three rows of plain knit/stockinette between. Or even insert a row of garter stitch, by purling around once. And a third way I have broken up the spiral pattern is to slant the decrease stitch in the opposite direction by doing the opposite of knit-two-together: slip one stitch as to knit; knit one stitch; pass slipped stitch over. This works well, but is a bit slower, at least for me, so I don’t use it much. It was used in the green shawl below as noted. 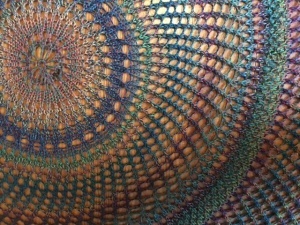 Here is a circular shawl made using a modified version of the basic pattern above. Basically, I just varied the yarn-over knit-two-together pattern by knitting several rows of stockinette between. Sometimes I also did some garter stitch for interesting texture variations. 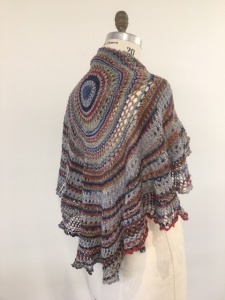 This shawl used three 50 balls of Paton “Kroy Socks” yarn, in the “blue striped rag” color. 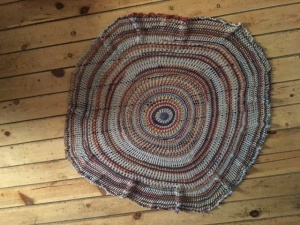 The shawl is about 40″ in diameter, after blocking. 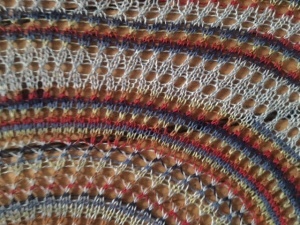 You can see the ruffled edge in this photo, due to the final increase in stitch count just before binding off. Below are some detail shots of the shawl, showing how the color changes of the yarn look in the circular pattern, and showing how the pattern was varied to break up or eliminate the spiral. Here is yet another variant of the circular pattern, made also with a Paton Sock Yarn in the “clover colors” version. 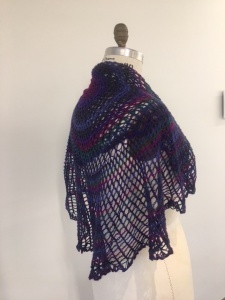 In this shawl, I took advantage of the fact that the two row pattern repeat of the basic pattern causes the spiral look as the pattern is repeated, because the yarn-overs all slant in the same direction, and when separated only by one row of knitting, are superimposed and give a slant to the look. For the last section of pattern repeats, I changed from a yarn-over, to a slip-one-Knit one-pass-slipped-stitch-over, as noted above, which largely neutralized the slant of the pattern in earlier sections. In the grey/red/blue scarf above, the interposition of several rows of knitting has a similar effect. 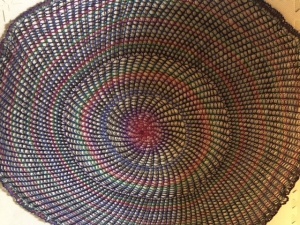 This is another shawl that blocks out about 40 – 45 inches in diameter. Below is a detail of the pattern showing the spiral and the non-spiral sections. 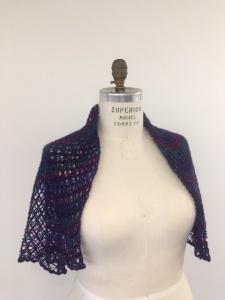 In the next post, we will talk a bit about starting to vary the shape of the shawl, and also about how to vary the pattern in interesting ways, using short rows.